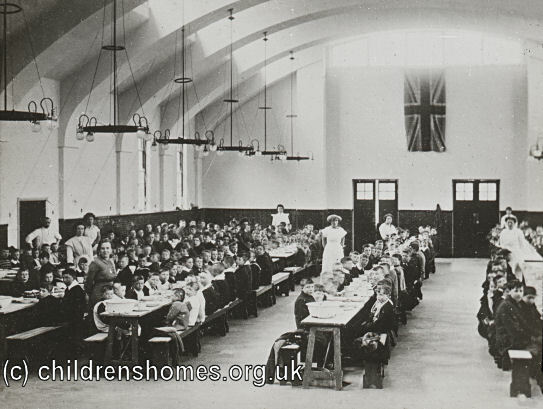 Although Thomas Barnardo had opened his Girls' Village Home in 1876, it was not until 1909 — four years after his death — that a comparable establishment for boys came into existence. 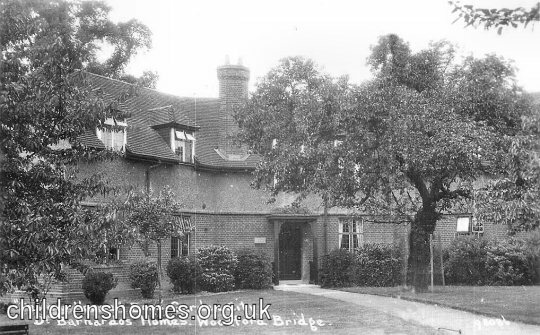 The Boys' Garden City, as the new home was named, was built at Woodford Bridge in Essex, in the 39-acre grounds of a large old property called Gwynne House. As with the Girls' Village, it adopted the "cottage homes" principle with the boys living in family-style groups each under the supervision of a resident house-mother. 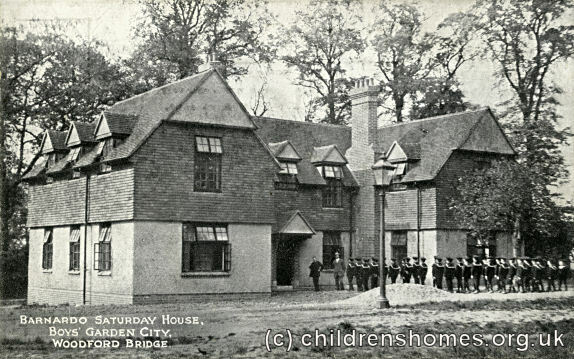 Much of the initial construction work for the site was carried out by boys' from the Barnardo's London Labour House who took up residence in at the property in 1909. On 21st July 1910, foundations stones for three of the first houses, in memory of King Edward VII, Dr Barnardo and Canon Fleming, were officially laid by Prince and Princess Alexander of Teck and Miss Fleming. 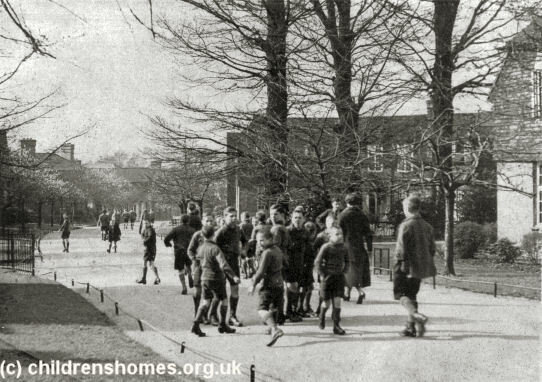 The Garden City was officially opened by the Duchess of Albany on 23rd May 1912, by which date twelve houses had been finished and with around 300 children now in residence. The scheme eventually also incorporated a school, dining/meeting hall, chapel, gymnasium and hospital. The layout of Garden City site in the 1930s is shown on the map below. 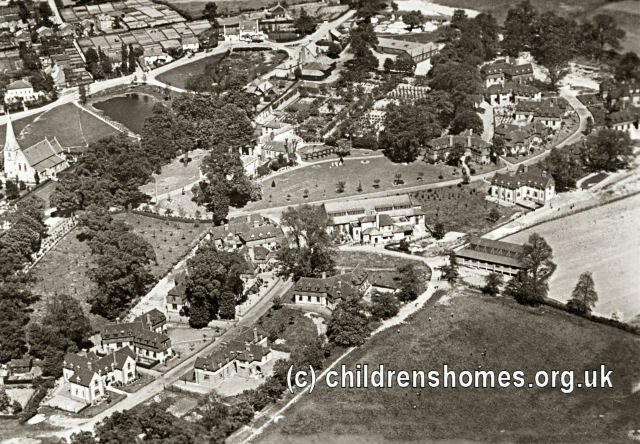 Boys Garden City site, Woodford Bridge, c.1938. 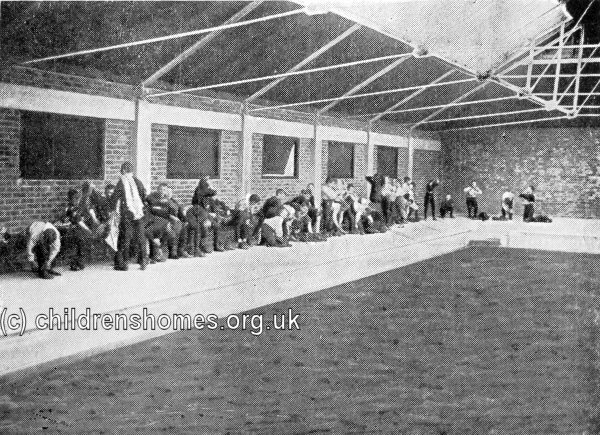 In 1911, a donation by a local family named Johnson enabled a swimming pool to be built. 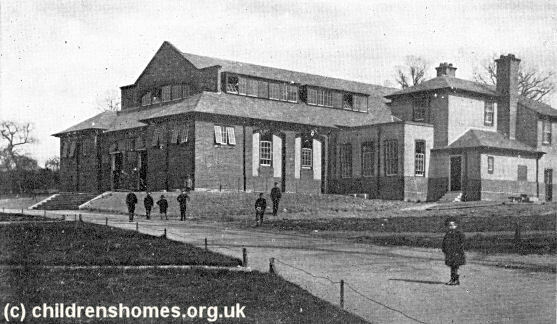 The home' medical facilities were originally based in a building similar to one of the boys' homes although a much larger facility, the John Capel Hanbury Hospital, was erected later. 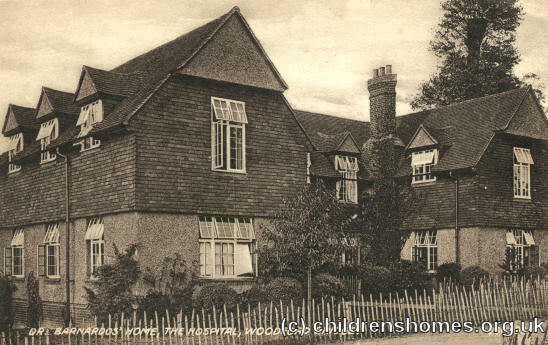 Canon Fleming Memorial House, Boys' Garden City c.1912. 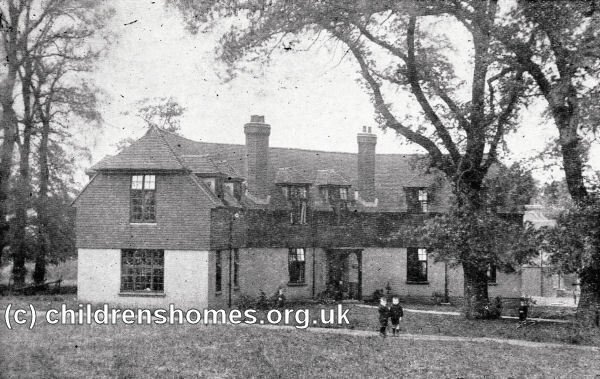 Pellew House, Boys' Garden City c.1912. The home's large central building for meeting and dining was Canada Hall, funded by the contributions of the people of Canada. Details of other developments on and around the site are given on the separate pages for John Capel Hanbury Hospital, Hanbury Hospital Home, Princess Margaret School, Hood House, Thurlby House, The Residence, Westfield and Dudley House. With the clouds of the Second World War gathering, boys from the home were being evacuated to safer areas as a precaution against the possibility of enemy air raids. 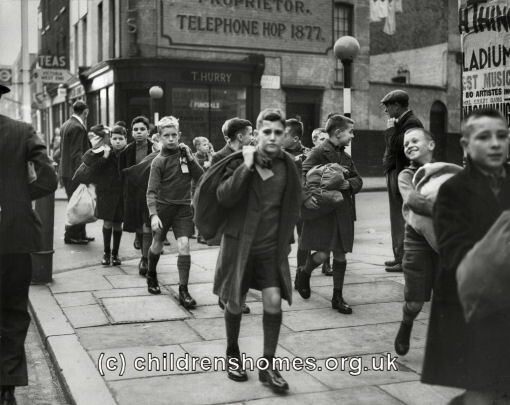 The picture below shows Garden City boys passing through London in September 1938 on their way to a camp in Surrey. The home was closed down during the war with a number of temporary homes being set up in large country houses in East Anglia and Scotland. 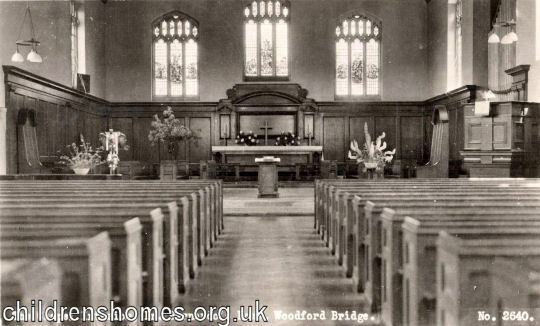 When Woodford Bridge re-opened after the war, it became a mixed home. A steady fall in demand for places at the home eventually led to the demolition of most of the cottages. Gwynne House and its stable block were sold off in 1985 and are now used as a hotel. In 1978, eighteen acres of the site were sold for housing development. The other surviving building, the home's former chapel, has also been converted to private residential use.